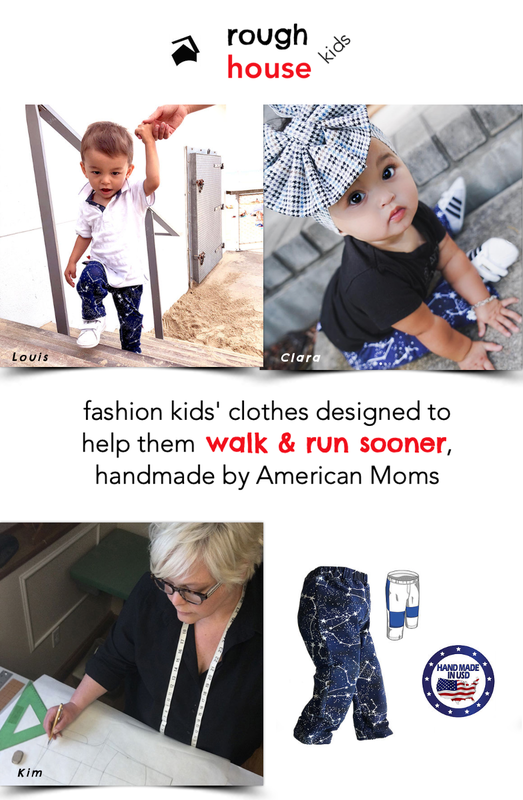 This is a guest post by Bethany Quisenberry, a capsule wardrobe stylist, wife to Kevin, mother of 2 boys and author of Cute Capsule Life. I’d been drawn to the idea of a capsule wardrobe for a few years before I finally made the leap. But all the capsules I’d read about seemed to require styles and colors of clothes I didn’t own. With an overflowing closet already, I couldn’t justify purchasing an all new capsule wardrobe. The turning point came when I realized I could create a capsule wardrobe from the clothes I already owned. I had LOTS of clothes. I really liked many of the pieces I already had in my closet. My trouble was making outfits I loved and dealing with my crowded closet. Building a capsule from clothes I already had was the perfect solution. Here’s how I made my capsule in five easy steps. Clear out your closet. Take every single item out of your closet – everything. If you don’t take everything out, you are more likely to give up and quit or keep items you shouldn’t. Place all your clothes on your bed. 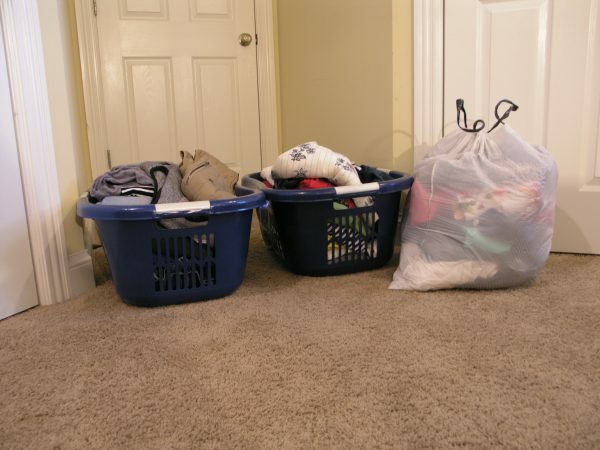 Put two laundry baskets and two trash bags on the floor beside you. 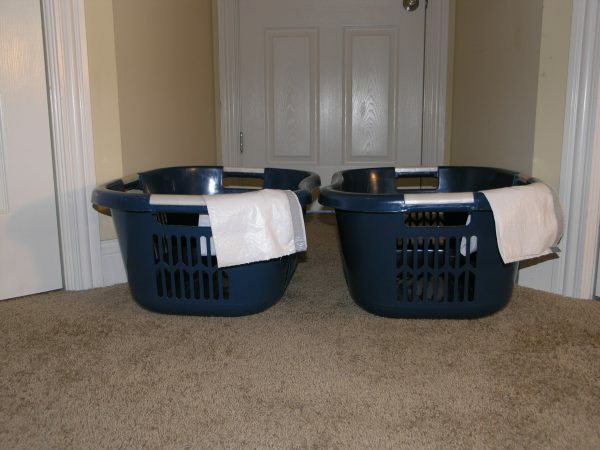 Label the laundry baskets “Yes” and “Maybe”. Label the trash bags “Donate” and “Trash” (or “re-purpose” – there are lots of ways to reuse worn out clothes for other purposes). Pick up one item at a time. Inspect the item for any damage or wear. Do you love this item? Try the item on – does it fit well? Great clothes that don’t fit are not going to look good. You will not gain all the benefits of a capsule wardrobe if you cling to clothes that don’t fit and flatter. Items that fit and flatter go in the “Yes” basket if you love them, and the “Maybe” basket if you don’t. Place items that don’t fit and flatter in the “Donate” bag if they aren’t worn out, and the “Trash” bag if they are. Those items that start in the “Yes” basket may still not work well in your capsule in the end, and you may find a piece you need to complete several outfits in that “Maybe” pile. 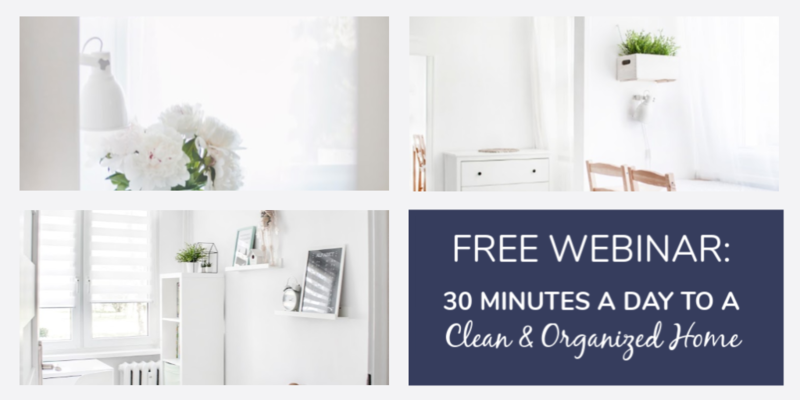 I’ve been diligently keeping my closet clear of worn out items, so I was really happy I did not need a trash bag this time around – a great benefit of a capsule wardrobe! 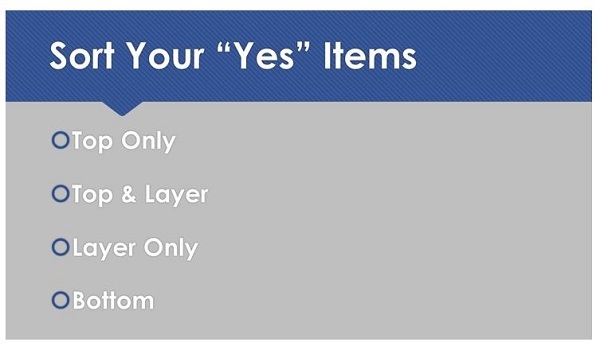 How many items do you have in your “Yes” basket? 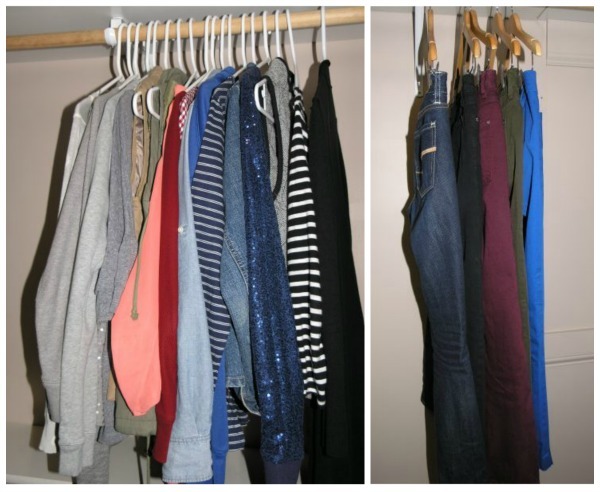 There is no magic number of items in a capsule wardrobe, but you will likely need around 20-40 items. I’ve had 24 items of clothing (not counting shoes and accessories) for both my summer and fall capsules. I create one capsule for spring/summer and one for fall/winter, though some favorite items get used in both. For a year-round capsule, you may need a few more items. Each item in your closet should fulfill a purpose and be worn on a regular basis and you should enjoy wearing every one. It is time to refine your selected clothes by looking for great combinations of your “Yes” items. The goal is to select items for your capsule which are versatile and can be worn many different ways. Look for ways to wear items you love that you never thought of before. Items that you can truly only find one to three ways to wear are not what you need in a capsule wardrobe. I’m not saying you can’t have ANY of these limited use items (I have a few), just that you have to restrict how many of them you include. By selecting the most versatile “Yes” items, you will build the most outfit combinations from the fewest items of clothing. Select a non-layering top from your pile. Write down a description of the shirt on a paper. 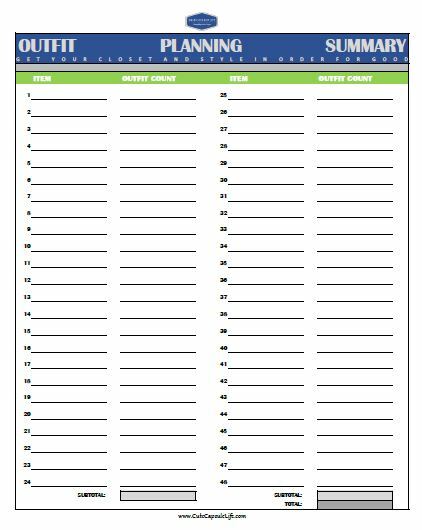 I created this free Capsule Wardrobe Planning Worksheet to make this step easy. Below the top description, list every bottom that coordinates. Next to each bottom, write down layering options that would make the outfit combination unique. Do the same for each top in your non-layering pile. Then complete the step for the layering tops, treating them only as a top, not a layer. Next, list each item from your “Yes” basket on another piece of paper and record how many outfits you designed from each one. 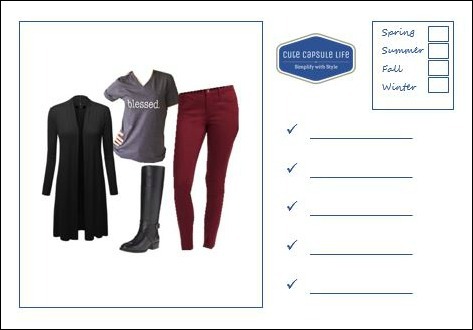 I use this Capsule Wardrobe Summary Worksheet for this step. If you ended up with up to about 20-40 items and 65-80 outfits, then you can skip this step. Do you have too many items and plenty of outfits? Then look at that summary worksheet to identify items that simply weren’t versatile enough to be used in many outfits. Those limited use items are the ones to consider eliminating from your wardrobe. It is fine to have a few of the less versatile items that you REALLY love, but if you want a capsule wardrobe, you can’t have many. Pick out a few to add to your donate bag. Go back to your worksheets and cross out the couple outfits that used that item. Repeat this until you’ve reached a number of items and outfits you are comfortable with. Do you have too few outfits? Then go back to the “maybe” basket and see if there are any items to add back that would create a large number of outfits. Layering items, like cardigans or a denim jacket, are my go-to items here. Make sure you like the items that you add in – every item in your capsule should be one you enjoy wearing. Time for my favorite step. It is time to put the items from your capsule back in the closet. These are the ONLY items going back in your closet, so your closet will no longer be cluttered and overflowing. Keep your outfit plan in your closet as a reference. I convert my outfit plan to a visual aid I call Closet Cards that make it SO easy to grab my outfit each morning. 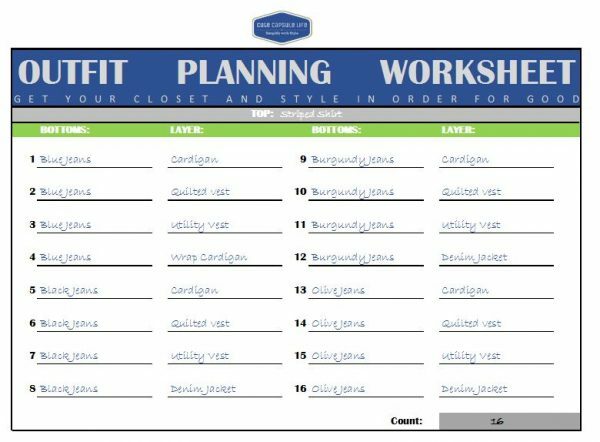 I share my Closet Cards and a free template to make your own cards each time I update my seasonal capsule wardrobe. Step 5 – Get it out! The final step may be the hardest. But it is also the most important to sustain your capsule wardrobe. All those items left in the “Maybe” basket, the “Donate” bag and the “Trash” bag need to find their new home right away. If you leave them on the floor of your bedroom they have a way of creeping back into the closet. I also recommend placing out-of-season items that may be great for your next season’s capsule in storage somewhere else in your house. Don’t store them in your closet where they could get mixed in with your capsule and make the closet look and feel crowded. Whatever you do with these items, do it quickly. 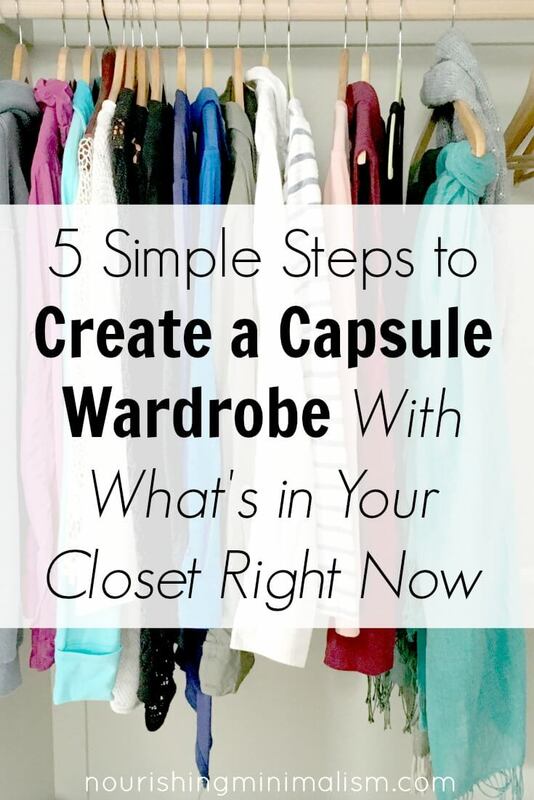 Creating a capsule wardrobe from an overflowing closet can be a time-consuming process. Allow yourself plenty of time. Try to complete Step 1 all in one session; it can take several hours to finish. You also need to be in the right emotional frame of mind. Are you feeling ready to let go, ready to simplify your life and look great every day? Don’t underestimate the time it will take to plan your outfits (Steps 2 and 3). My first time took about four hours for planning, but the next season’s update took less. 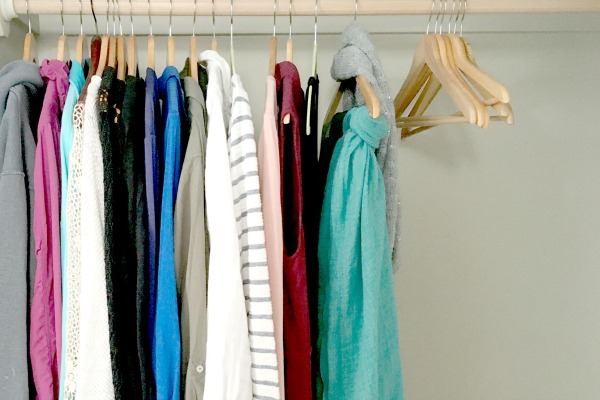 Before you even start creating your capsule wardrobe, have a plan for what to do with your leftover items. Otherwise, they have a tendency to creep back into your closet. Any items not in your capsule need to be out of your sight as quickly as possible. Finally, although my goal was to create my capsule from just the items I already owned (and I still believe this is absolutely feasible) in the end, I did add a few new versatile pieces to my capsule. And that is OK. I had two reasons for adding a few new items. First, I chose pieces that really increased the number of outfits I could make and add variety to my outfit options. I would not have achieved 80 outfits combinations without adding a few items. I added pairs of burgundy and olive jeans to my fall capsule so I would have an alternative to wearing blue jeans nearly every day. Second, I enjoy clothes and style. By adding a few pieces, I am able to continue to enjoy new looks each season and keep up with fashions I like. 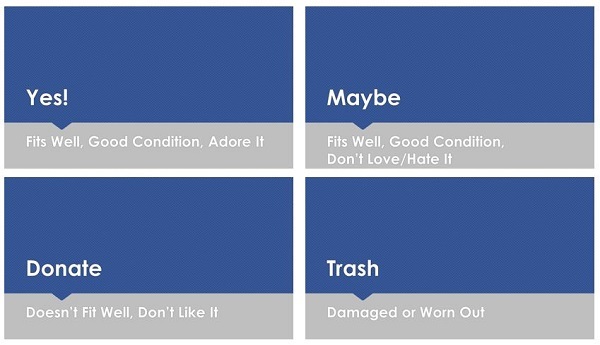 I find this critical to sticking to my capsule wardrobe. You can read more about Bethany and her capsule wardrobe on her blog: Cute Capsule Life or catch up with her on Facebook, Pinterest or Instagram. Easiest way for me, was to have solid neutral bottoms and have blue and green tops in solids and some prints, this way everything mixes/matches as bottoms are either navy or denim, khaki, grays, black. Shoes, purses, outerwear are neutrals. Others may choose three top colors. Denim/chambray bottoms and some shirts are incl. Hope this motivates others to do likewise. (active wear not incl. in capsule) I haven’t owned dresses/skirts in decades am retired, have several dress pants and blouses. I go thru clothes end of summer and winter. This is such an inspiring article. 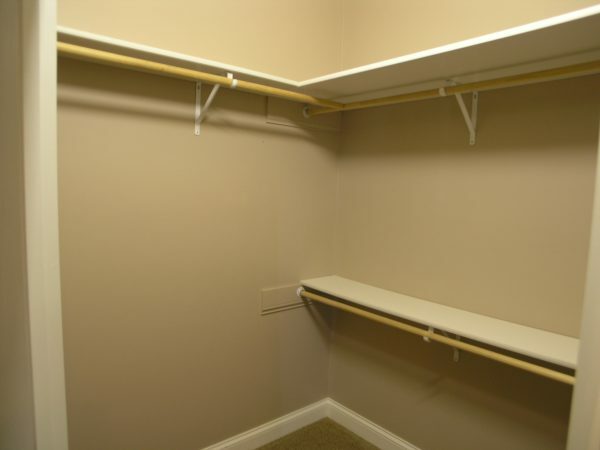 I am a budding minimalist and have successfully cleared many areas of my home and life in recent years but now find my wardrobe has expanded to such an extent that I need to take action once more ! This article has given me the push I needed and I have just bought one of those jumbo size zip up storage bags for £2 ready for action! My intention is to fill it with all the items of clothing which are in good condition but which I know no longer give me the joy they once did. This bag will then be donated to charity. I intend to begin tomorrow and will post again once my mission is complete! 80 items and 30 coathangers packed into bags ready for the charity shop. Winter wardrobe neatly arranged and Spring/ Summer items edited for next year. Listen, this is my first time reading your blog, but if the rest of it is anything like this… Do us all a favor and write a book. I need pages and worksheets printed out that I can return to again and again. It also needs to travel with me from place to place. I appreciate the value of a blog, I really do. But sometimes you need the information to be tangible and return to it. So… please? My biggest struggle is the pile… does not fit but I love it. I am having a hard time getting rid of clothes that don’t fit. After my third child, now 5, I became very depressed. I gained 65 pounds in the last 5 years and I have held on to so many of my clothes. The clothes I love and that felt like me, don’t fit. Now that I am wearing size 2x, I can’t find clothes that I love. So, now I am stuck with a bunch of clothes that I love that don’t fit and a bunch of clothes that I don’t like but fit. My sister did encourage me to join stitch fix and I have found some luck but overall, I am drowning in clothes. I guess I really have to just donate all of my old clothes and jackets. It makes me incredibly sad to let them go because it’s like I am giving away a part of my life that I desperately miss but at the same time holding onto them isn’t serving me well. Any advice??? That is so hard, I’m sorry! I’m currently facing the same dilemma. For myself, I kept the pieces that I love, set a deadline for myself and started eating better and exercising. 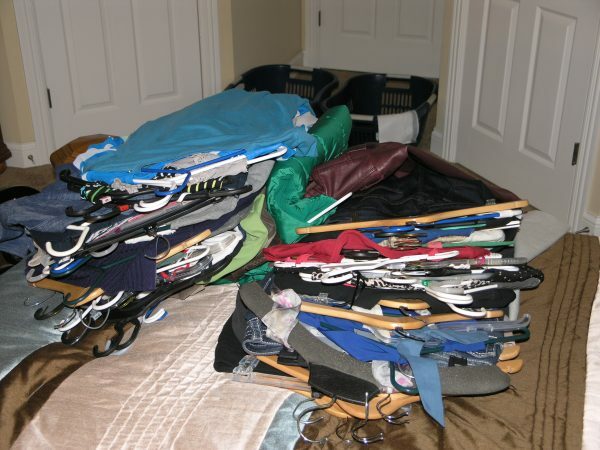 I knew if I didn’t change my health habits, there was no point in saving the clothes. My plan is that when I hit that date, if my weight hasn’t dropped, or I quit exercising, then I am planning to accept myself the way I am and let go of the smaller clothes. And I’m allowing that I can reevaluate at my set-date if I’ve dropped some weight and still being consistent with eating/exercise habits, then I’ll set another date further out to see if I can reach my goal. If you are content with your weight, then I would say it is time to let the items go. And if you change sizes again, reward yourself with new clothes. Having something sitting in your closet “shaming” you each time you see it isn’t healthy. Everyone is different, you may find that the clothes are good motivation for you to change your lifestyle, or you may find it healthier to live without having those clothes reminding you of negative feelings. When going thru my closet, I found more items that fit and that I loved than would qualify as a capsule wardrobe. I decided to keep all of them and will evaluate at the end of the season. Then I will discard the items not worn.